The Trailblazers had a surprisingly good hike today! The weather forecast was for wind and rain and it was absolutely dreadful when we gathered at 9am. Mike and I were the first ones there and we stood in the wind and rain wondering whether any other fools hikers would show up. The senior center was closed early (just a bit!) for Christmas so we sat in my car for awhile to keep warm. Then Frank and Marjan drove up, and the Ferndale Four and pretty soon we had about a dozen people gathered under the awning. Pat and Leroy decided to drive over to Deception Pass and take advantage of the “rain shadow” effect in the lee of the Olympic Mountains. I haven’t heard the results of that expedition, but given the winds we had here in town I can imagine what it was like out at the end of the Strait of Juan de Fuca. As we drove the 10 miles to the North Shore Lake Whatcom trailhead (located near the southeast corner of the lake, of course – go figure) the rain diminished and it was hardly raining at all when we hit the trail, which follows the route of an old railroad line along the shore of the lake. The railroad connected the Blue Canyon Coal Mine to the settlement at Silver Beach on the north shore of the lake (No, really, it is on the north end of the lake. No fooling.) and part of its length was on trestles over the water, of which there are a few remnants here and there. Most of the pictures I took didn’t turn out – they were all blurry due to camera movement. Even though it had stopped raining it was still very dark, and I had left at home my new camera, with its nifty image stabilization feature, since it was going to be raining all day anyways. Sigh. We missed DJan, our esteemed Blogger-in-Chief and Purveyor of Yummy Brownies, who was away on a sad trip for the funeral of one of her skydiving friends. (Can you even imagine what it must be like to get a last minute plane ticket at this time of year?) She will be back on Christmas Day and expects to rejoin us next week. By the way, Fred covered for her on the brownie front so no one fainted from chocolate deprivation. 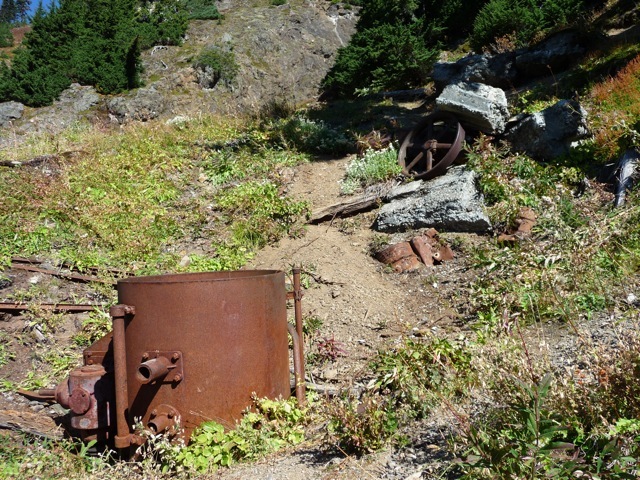 On Tuesday, my friend Earl and I took a much delayed hike to the old Gargett Mine on the side of Mount Larrabee. 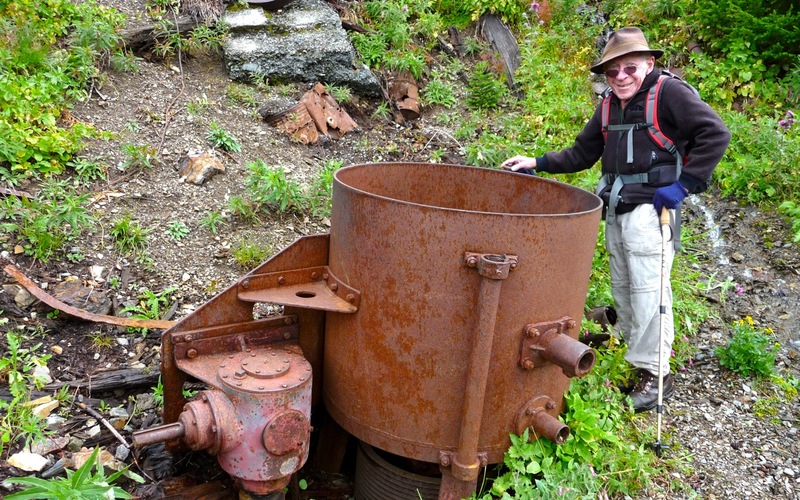 Earl is a Bellingham Lifer, with the exception of a mid-life parole in California, and has a strong interest in local history in general and mining in particular. We left Bellingham in fog but soon saw some blue skies, although there were plenty of clouds all day, too. The road to Twin Lakes is in better condition than I’ve ever seen it – just about any car could make it to the lakes with a little care – and it was so nice to be in that beautiful spot without a jillion cars and smoky campfires! The first thing we noticed was that every mountain around us had some fresh snow – I think we can safely say that summer is almost over and we should prepare ourselves for a premature end to the high country hiking season. 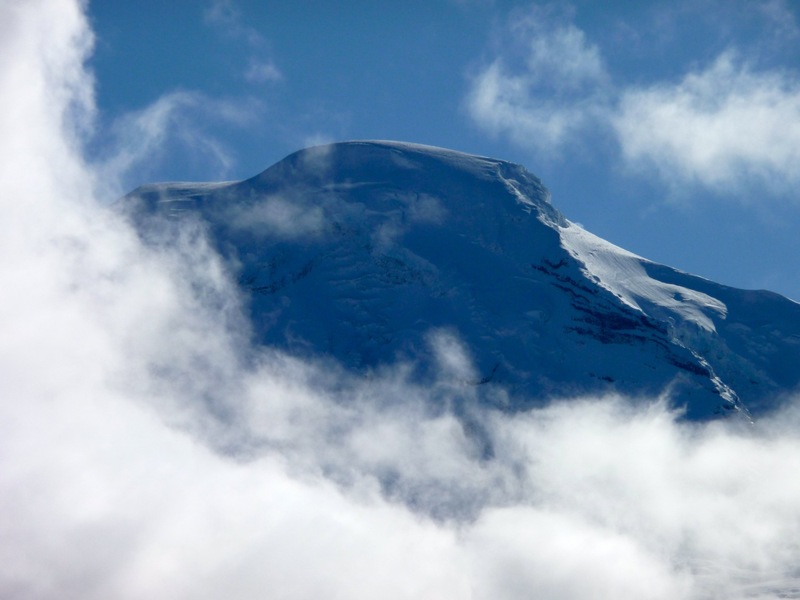 The snow is above 6000′ of elevation at the moment, which will not interfere with most of our hikes, but it does put next week’s hike to Ptarmigan Ridge into some jeopardy. As we hiked out toward Low Pass the clouds obscured the grand views of distant mountains but provided their own smoky splendor. 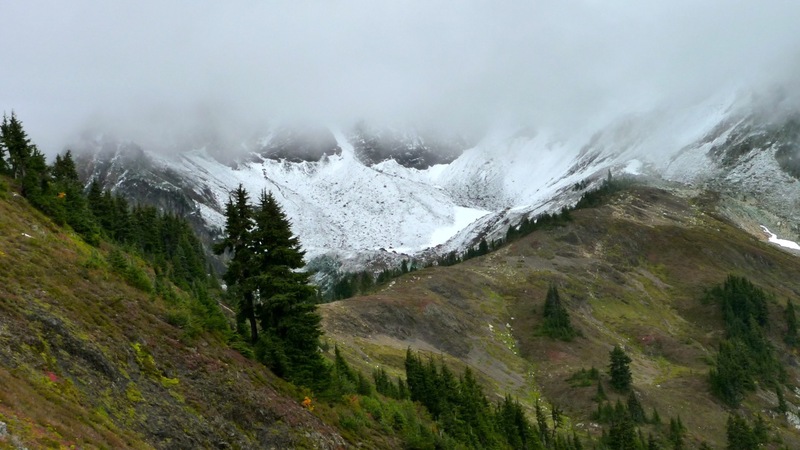 A little further on they allowed us a haunting view of the new snow on Mount Larrabee just above High Pass. We blew on past High Pass toward the mine, bemoaning once again the pathetic supply of blueberries. This is a very lightly used trail (most folks who manage to drive to Twin Lakes just hike to Winchester Mountain, if they leave their cars at all) and should be awash in berries at this time of year, but we found only a few truly ripe ones and those were mostly small. There were many that were hardly bigger than a BB. But we could enjoy the gorgeous landscape even without berries. As we hiked down from High Pass toward the mine, the stream that drains the cirque above High Pass was aroar from the recent rain and snow and beautiful to look at – the only concern was that we would have to cross it in a few minutes. Usually it is little more than a trickle but this time we would have to hunt around for a safe crossing. The Forest Service maintains this trail as far as High Pass and has done some great work on it in the last couple of years. Beyond that point it has deteriorated significantly. It has been especially damaged by shortcuts, to the point where the moderate old mule trail has nearly disappeared in spots, supplanted by excessively steep cutoffs. Last year I went out and spent a few hours one day trying to locate and partially clear out the old trail, but it is still hard to find in places, with some smallish Christmas-size trees growing right out of the trail. I think I should try to go back out again this year with a bigger saw – anyone interested? The mine entrance, or adit, is pretty hard to see from a distance but you can see one old rusted tub-like affair from High Pass. On closer inspection it is more than a tub, with pipes and gadgets and driveshafts for whatever purpose. There are a lot of other old pieces of iron and sheet metal lying around and it makes you wonder how they managed to get that stuff up here. You can see from the picture that the “tub” is a pretty big chunk of metal – what you can’t see is that the walls are a good half-inch thick. Someone, or perhaps a storm, has modified the adit since the last time I was there. 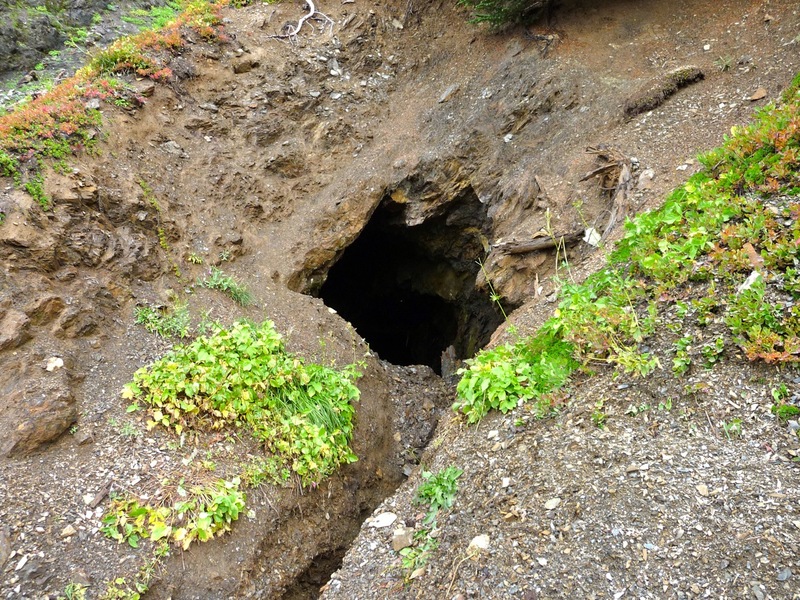 In the past you could walk right up to a wooden framework and stick your head inside, but now it is just a literal hole in the ground, and there is an active stream cutting a tiny ravine. It was too dark to see much, but the camera’s flash showed some old timber bracing standing in a foot or so of water and lots of debris under the water. Drops of water fell almost constantly from the ceiling and plopped into the pool – if you look closely you can see a small splash in the picture, near the center bottom. You can also see a brilliant white spot on the ceiling near center top. We couldn’t get close enough to see it well, but my guess is that it belongs to a vein of pure white quartz, just the sort of thing that would have drawn prospectors to dig, since gold and other heavy metals often are found along such quartz seams. 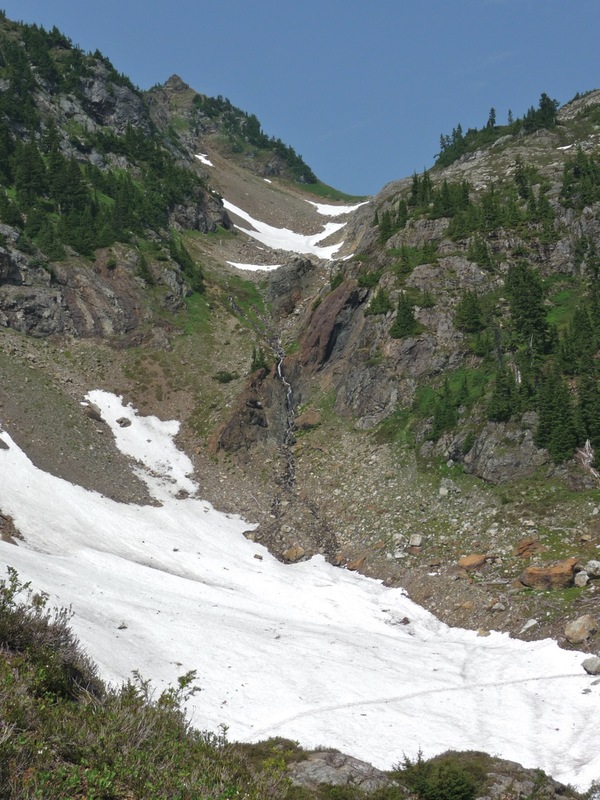 We walked back to High Pass to have lunch, by which time a lot of the new snow had already melted on the trail up Larrabee. The hike back was as lovely as the way out, including a nicely framed view of Winchester Mountain – if you look very closely you might be able to see the flag flying at Mount Baker Club’s lookout cabin. Just before reaching the trailhead, on the side of Winchester, I took a bunch of pictures of some bizarre looking boulders that I’ve noticed on earlier hikes. They are mostly brownish-gray with a sandy texture, but show a number of roughly lenticular inclusions of a smooth, almost silvery light gray rock that stands out prominently from the background. They look to me like they might be bits of marble. From the general look of the rock, I was guessing that they are from the Yellow Aster Complex that I have gone about at great length in earlier posts. And when I got home I looked at the state geology department’s online geologic map and found a little tiny speck of YAC right at the very summit of Winchester. From the location of these boulders, it is not too hard to believe that might have tumbled down from that summit. Back at Twin Lakes we took the side trip over to Skagway Pass to look down at the only active gold mine in the area, the Lone Jack Mine. There was no sign of activity, and no big piles of quartz ore, so we guessed that they have completed their operations for the season, not a moment too soon from the looks of the new snow. 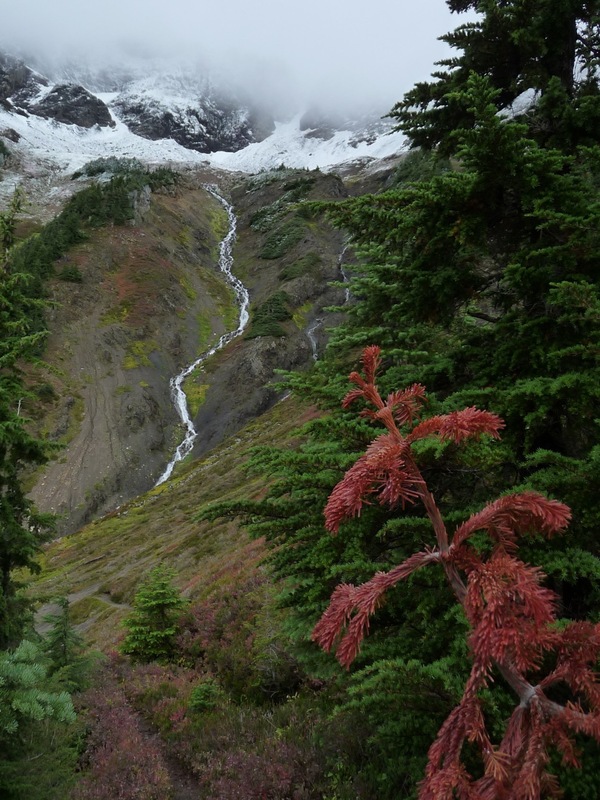 Yellow Aster Butte is arguably the most geologically interesting hike in the Mount Baker area (and that is saying something!). In the course of less than four miles, you walk on remnants of at least three different tectonic plates, or terranes. Some may have broken off from other continents, others might be oceanic island arcs (like Hawaii), but wherever they came from, continental drift has piled them up on the western edge of North America long ago. Now they are all scrunched together, eroded over time, and form the the western portion of the North Cascades. It is possible that similar formations underlie the Cascades further south, but there the remains of the huge chain of volcanos that built the Cascade Range are what you see. Only up here in the north have the Cascade lavas eroded away almost entirely (the Black Buttes and Table Mountain are exceptions) to expose these “basement rocks”. I have given a lot of attention over the last ten years to trying to find the actual transition lines between these plates. 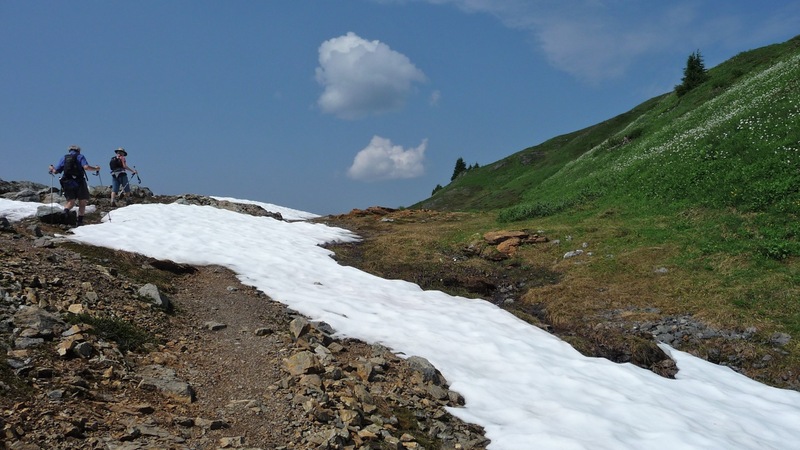 The heavy vegetation and snow cover, and the extreme complexity of the formations themselves, generally make it pretty difficult for an amateur to find those faults, but this trail has a couple that just shout at you. Well, they whisper really loudly, at least. 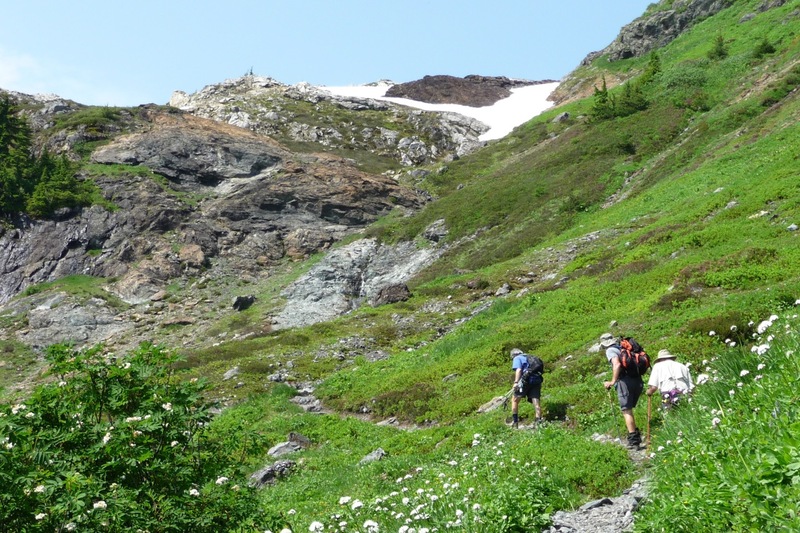 The hike starts in the Swamp Creek valley on rocks of the Easton terrane, crosses the Chilliwack River terrane as you go up through the woods and ends on the Bell Pass Melange and the Yellow Aster Complex. As usual, I ran on and on about the geology, but I decided to pluck that stuff out and put it in a little appendix so I could get right to the pictures. As you walk along on the level part of the Yellow Aster trail after splitting off from the Tomyhoi Lake trail, the rocks gradually change from the Chilliwack to the Yellow Aster Complex. The change is gradual because you are walking very close to the fault-line; the Chilliwack is below and the Yellow Aster Complex above the trail, so the rocks you see are pretty jumbled up. At the end of this mostly level stretch of trail, about 2.5 mile into the hike, you come to a series of strange, bare, brown hills followed by a sharp drop into a valley, usually filled with snow. This is the first of two striking fault zones. The brown hills are solid serpentine, which usually shows up near faults. 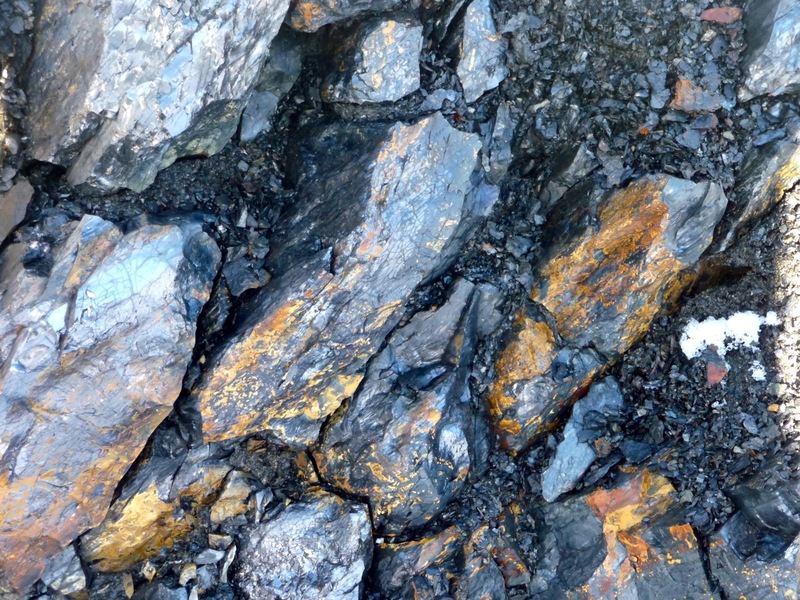 It is also usually green and shiny, almost like jade, but here it is darker, almost black, and is heavily weathered – iron produces the rusty brown color. It is very common to find stream valleys following fault lines, since the movement along a fault tends to grind up the rocks, making openings for water and roots to get in and do their erosional magic. Looking up toward the butte, you can also see some brownish serpentine on the face of the notch, just above the center of the photo on the left. This fault separates the Yellow Aster Complex, on the right, from the Bell Pass Melange, but the difference is not at all obvious from a distance. But the really cool, textbook example of a fault exposure comes almost another mile up the trail. The first picture shows Con, Cindy and DJan approaching the fault, which runs diagonally across the scene just above the middle. Notice that on the lower right we are hiking along an even slope through a lot of wildflowers and there are few exposed rock outcrops – and then suddenly it is all bare, craggy rock with only sparse vegetation. The snow puddle at the upper right is lying right on top of the fault, and draining along it right through the big shiny gray patch (which may be more serpentine) near the center of the picture. Wherever I’ve found the Bell Pass Melange, I’ve noticed that the terrain is comparatively smooth, with few outcrops, and the samples I’ve picked up are always covered with moss and lichens and such. Perhaps there are some really tasty minerals in there, or maybe it’s because of all the nooks and crevices between the various components of the melange, but this stuff seems to weather and erode away easily. On the other hand, the Yac is very old and much harder and more compact. When we got up on top of that snow puddle the contrast was even more striking – we were picking our way through sharp, bare rocks and a few feet away was a gentle mountain meadow leading up to the top of the butte. It is not unusual for the nature of the underlying rock to affect the vegetation that grows on it, but this is a particularly good example. In the last picture you can see that the snow near the center is lying right on the fault, and that the transition is only a few feet wide. As promised (threatened?) here is some more on the geology. 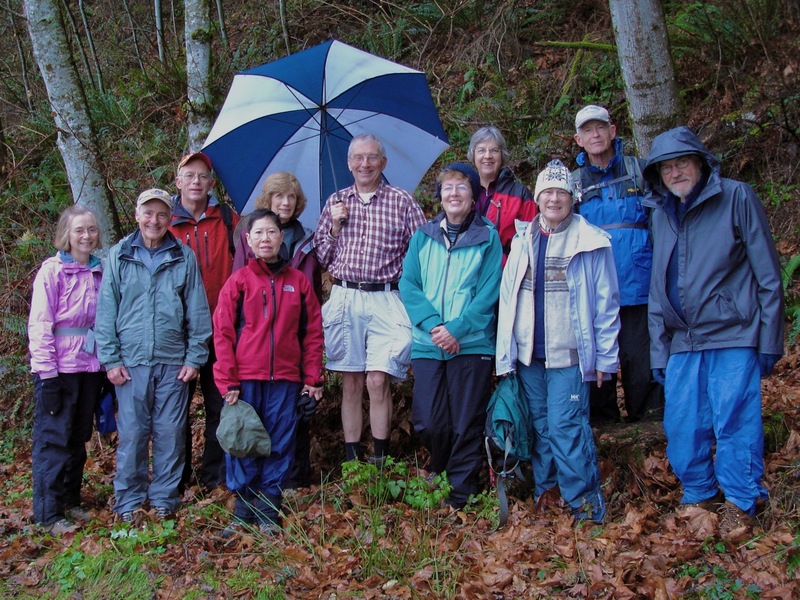 The hike starts in the Swamp Creek valley on rocks of the Easton terrane, called the Darrington Phyllite. 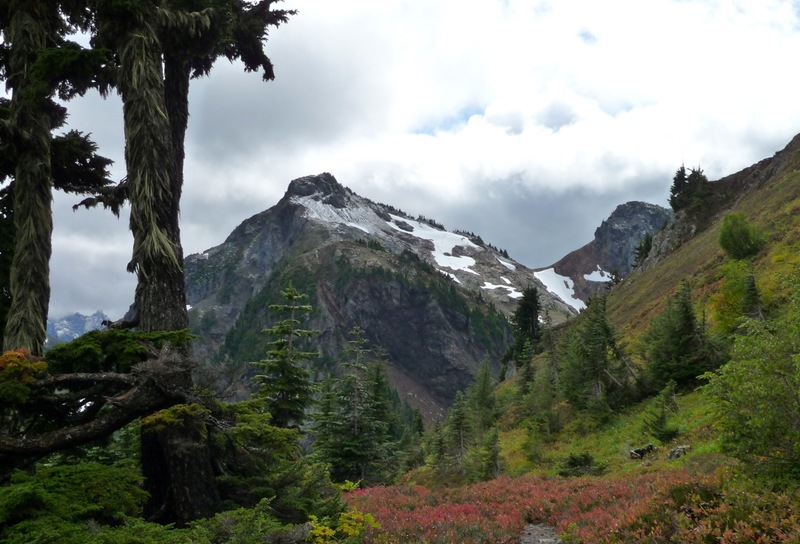 Goat Mountain, across the creek, is one big chunk of phyllite, and we’ve seen it often on other trails (Anderson Mountain…), but we don’t see much along this trail since it is covered by glacial deposits and a lot of vegetation. 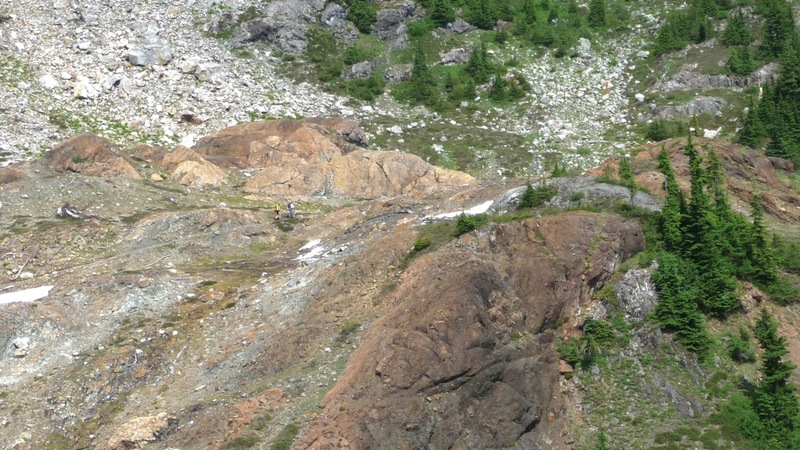 Most of the gold mined in the Mount Baker area was found in quartz seams in this formation. 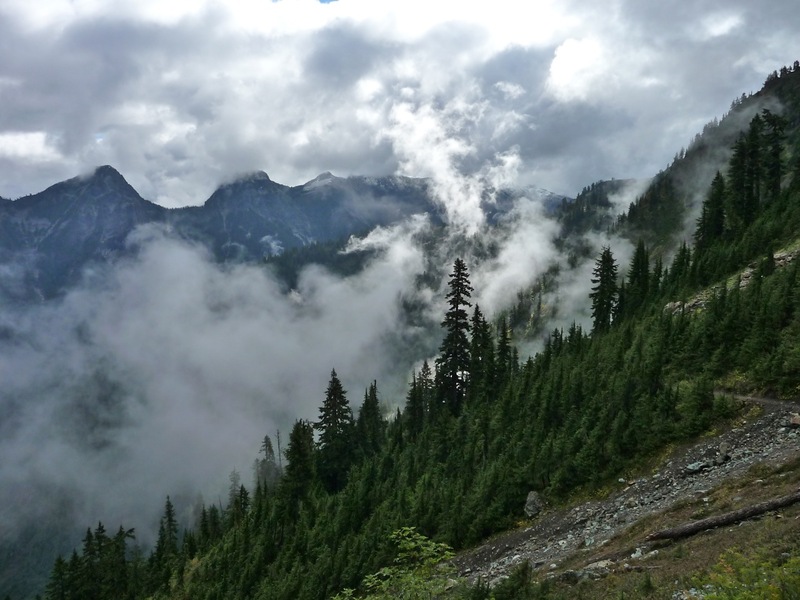 As the trail rises through the woods it crosses onto the Chilliwack River terrane, a broad mixture of various volcanic, sedimentary and metamorphic rocks that is very widespread in the area (Herman Saddle, Canyon Ridge, Sauk Mountain…) but the forest hides the transition. The first really noticeable rocks don’t appear until you are on the section of the trail that contours around to the north and west from the Gold Run Pass / Tomyhoi Lake trail toward Yellow Aster Butte and Mount Tomyhoi, and, at first, these are the Chilliwack rocks. Now the Easton and the Chilliwack terranes are very nice, I’m sure, and very important geologically, but it is the third terrane that has always interested me most. It is called the Bell Pass Melange, named for a seldom-visited pass at the head of Bell Creek, a tributary of the South Fork of the Nooksack. That pass is a saddle in the ridge that joins Mount Baker to the Twin Sisters and separates the South Fork from the Middle Fork. (That really has nothing to do with today’s story, but I put it in to emphasize that these various terranes are all jumbled up and crop out all over the place. It is a very, very complex system.) The geologists call it a “melange” (French for “mixture”) probably hoping that it will sound sophisticated and most people won’t notice that they really don’t completely understand what’s going on here. There are several very different types of rocks within the melange, and each of them is strange and extraordinary. The most prominent local exposure of this terrane is the Twin Sisters Range, which is one great big chunk of ultramafic rock called dunite which is composed entirely of one mineral, olivine (which is unusual in itself), and began it existence as part of the earth’s deep mantle, rather than the thin, crispy crust we live on. Somehow it got attached to a piece of crust that got turned upside down in some violent tectonic interaction. Another is the Yellow Aster Complex (note the use of another general purpose noun to cover a lack of full understanding). 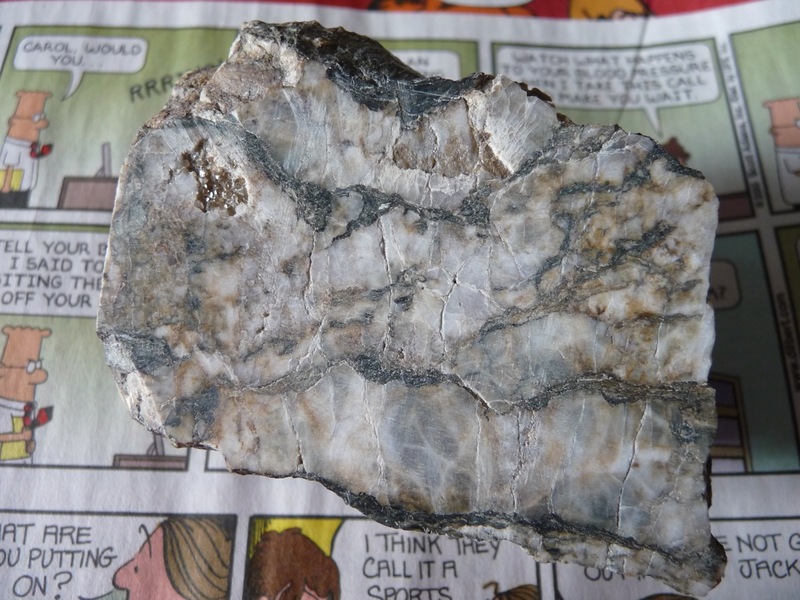 I went prospecting for this one a few weeks ago on my trip to the Baker Lake region. It is very old and is sometimes called the Yellow Aster Gneiss, since it is rather coarse grained and has undergone metamorphism, but it is cut with other things, and is truly a complex within the melange. I’ll call it “Yac”. 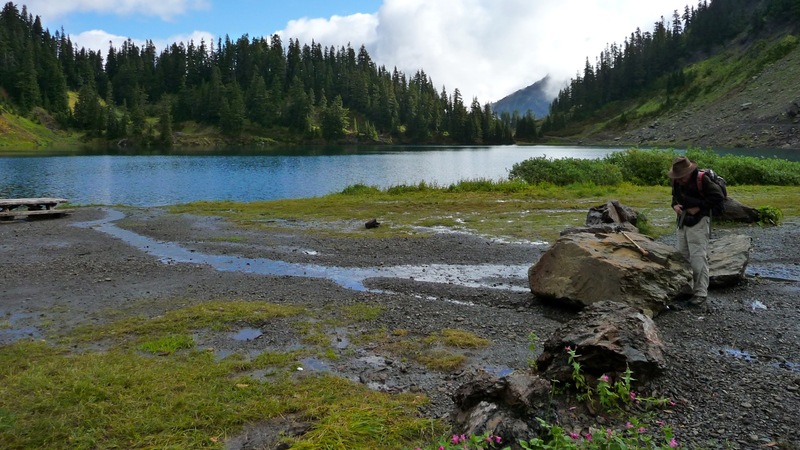 It was named for this general area, probably for the area west of the butte where the chain of small lakes is and where a good deal of prospecting and perhaps mining went on at one time. 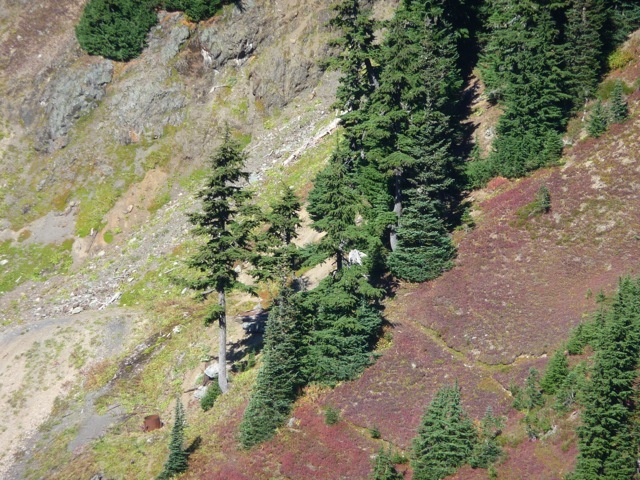 That area is entirely underlain by the Yac; but the part of Yellow Aster Butte that the trail leads to is actually built of the third rock species. My favorite is also called, confusingly, the Bell Pass Melange (Bpm). So it is a melange within the melange. (From now on I will use the term “melange” and “Bpm” to refer to this particular rock, rather than to the whole terrane. Why do people do things like that?) It is a truly gnarly and mixed up mess. It is dark gray to black overall, but with bright white quartz intrusions, folded and layered parts that almost look like petrified wood, cracks, crevices and what-all. 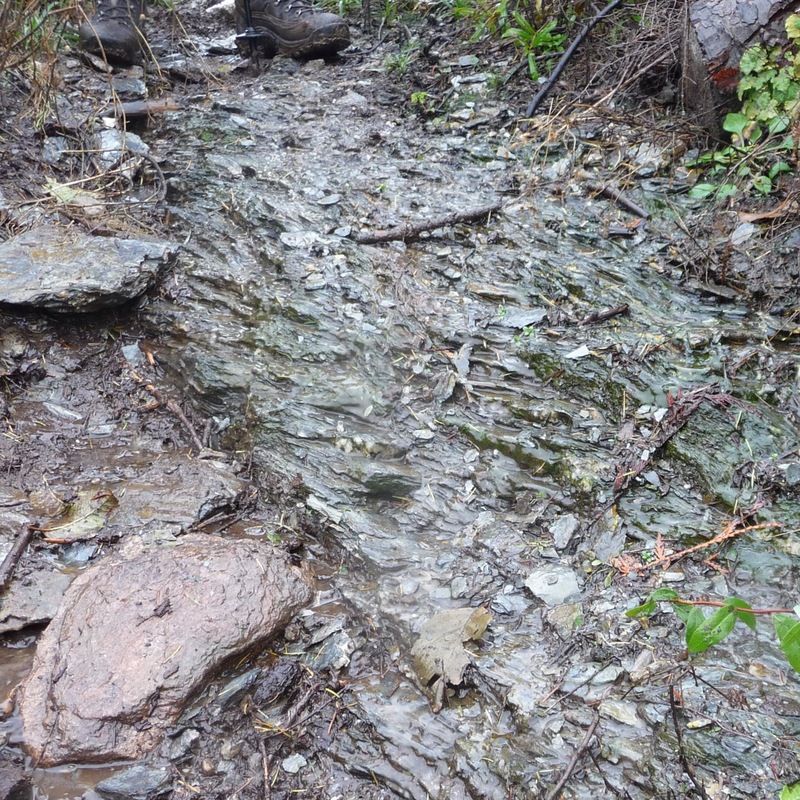 When you hike that last steep slope up to the “top” of Yellow Aster Butte, this is the stuff you are stepping on. As I mentioned above, it seems to weather rather evenly, so it tends to hide from view under vegetation, but substantial outcrops can also be found in the Middle Fork area (near Elbow Lake and, strangely enough, near Bell Pass) and near the west end of Canyon Ridge. 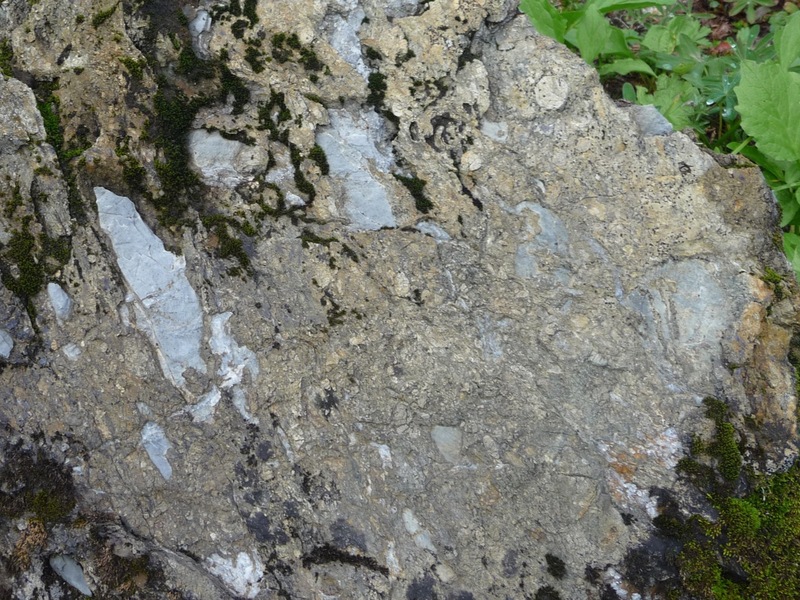 These pictures are of samples I gather near Schrieber’s Meadow (Yac) and the Middle Fork (Bpm). The last one is of a small piece, also from the Middle Fork, that I sliced and partially polished in my lapidary class last year. The teacher wouldn’t let me cut it in the big slabbing saw because it looked like it would shatter and jam up the works. You can see many small cracks and rusty spots and near the upper left you can see some crystals forming a small geode. It is really strange stuff. I hadn’t been out on the snowshoes for awhile and was feeling the onset of a case of cabin fever, and the weather forecast was good, so on Monday I went up into the mountains to see what conditions were like on Coal Pass Road. I hadn’t been up there in quite a long time since there has been too much snow at low elevations for the last few years – you have to be able to drive up to an elevation of about 2500′ in order to make it a reasonable hike up to the end of the road in the vicinity of Coal Creek, where there are some great views of Mount Baker. The road is one of several in the area built back in the 1930’s by the Civilian Conservation Corps. I attended a presentation about the CCC several years ago sponsored by the WWU Lifelong Learning program where these roads were discussed. Lately I have seen it referred to as “Coal Creek” Road, but that seems to be another bit of the local geographical silliness – anyone would expect a road with such a name to travel up the valley of the eponymous creek (e.g. Canyon Creek Road) but this road runs up a ridge between Davis Creek and Deep Creek for most of its seven mile length before it even approaches Coal Creek. The road does lead to Coal Pass (or it did at one time) so the old name makes at least some sense. The first viewpoint was a bit disappointing. 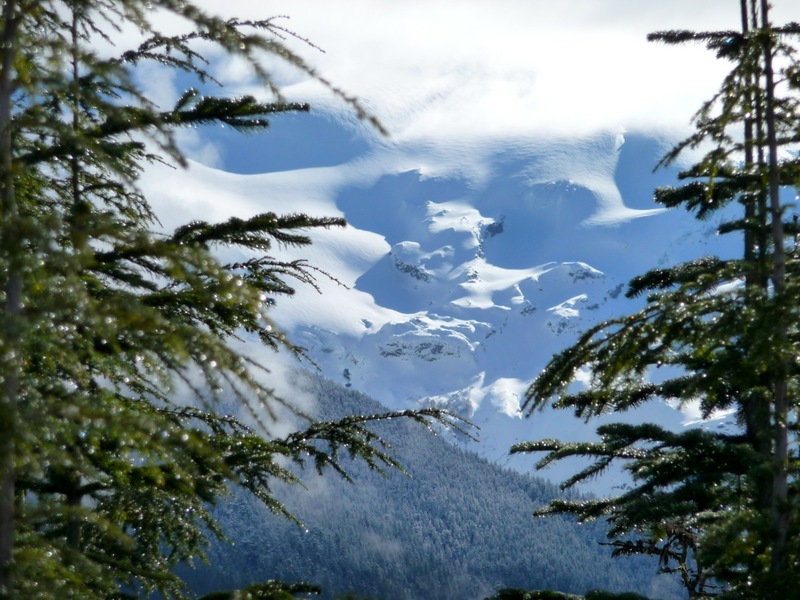 The trees have grown a bit, and although the day was lovely and sunny, Mount Baker was mostly obscured by clouds, with just a few peek-a-boos up into the Heliotrope Ridge / Coleman Glacier area. I called this “the end of the road” but it is just decommissioned at this point – the old roadway continues on toward the site of the old coal mine that gives the creek and the pass and the road their names. Since it was still quite early and I hadn’t gotten much exercise yet, I headed up toward the mine. It is a bit of a slog since, in addition to the young alder saplings and the occasional fallen tree, the roadway is cut several times by ditches marking the sites of removed culverts. 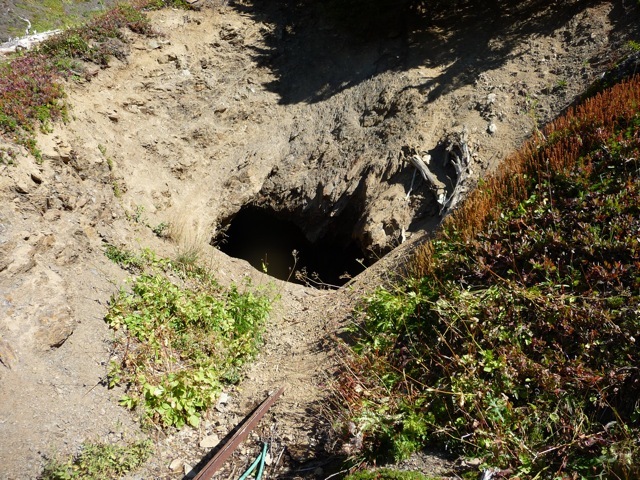 A hundred yards or so from the mine, you have to leave the roadway and go downhill for awhile. The tangle of alders gets worse at this point and the trek devolves into a true bushwhack. Not in the sense of getting lost, since you can see the destination all the while – you just have to whack a lot of bushes. And all of a sudden I came across a cleared out channel running right down to the mine site – almost like a mini-half-pipe. 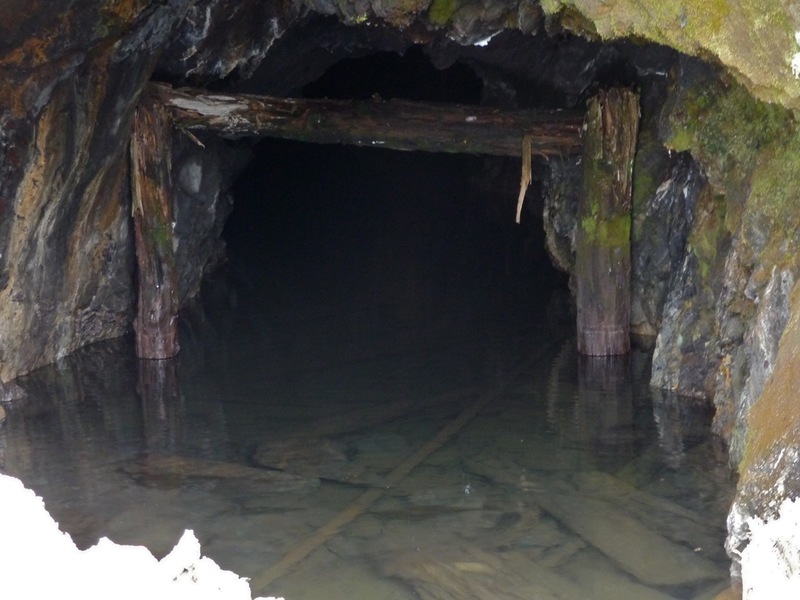 (The picture looks back up the “pipe” from the mine.) I have no idea why it it there, but I took advantage of the absence of “bushes” and headed on down. Part way down the chute the snow had melted from one side, exposing a pile of shiny black rock with brownish-gold frosting on some surfaces. I’m no expert, but I took this to be coal of the high-sulfur persuasion. 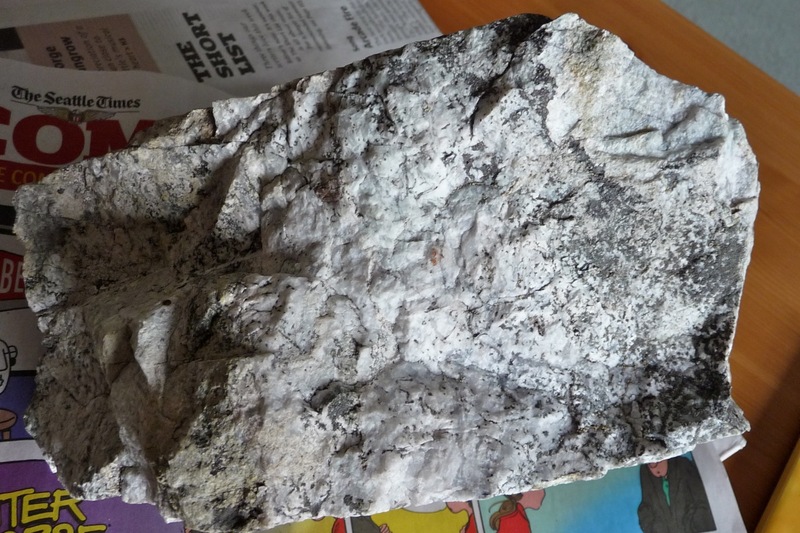 It didn’t look very much like the stuff we had in our coal bin when I was a kid, but who knows how much that had been processed before I saw it? (And then there is just the remotest possibility that my recollections, sixty-odd years later, might be ever so slightly less than perfect.) I brought home a couple of small pieces with the intention of trying to see if it burns, nut I haven’t gotten around to that. I had intended to poke around the mine site but it all of a sudden dawned on me what a stupid idea it would be to walking around near a place where there might be very deep holes with the ground obscured by snow, even if seemed to be only a few inches deep. So I kept to the high ground as I headed back to the old roadway and further on up toward Coal Pass. But the roadway quickly turned into such an impenetrable thicket that I couldn’t be sure if I was still on it. At one point I even circled back onto my own tracks. So I acknowledged defeat and headed back down. Back near the “end of the road” there is a spur that heads up to a logging yard and provides another marvelous viewpoint. By this time the clouds had thinned out a bit but the view was still quite limited. 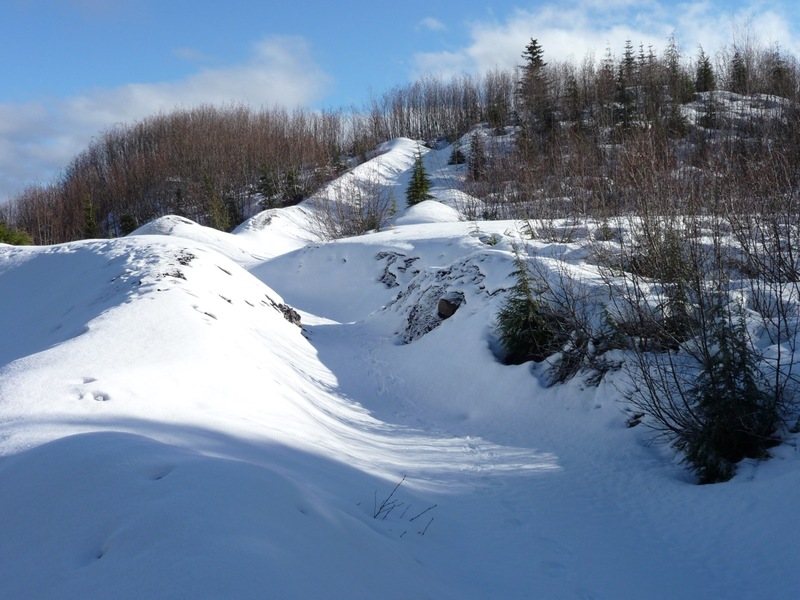 So the trip was a bit of a bust by a number of objective assessments – very little actual snowshoeing, no exploring the mine, no trip to Coal Pass, not much in the way of photography – it was still wonderful to be out in the sun and the fresh, chilly air. And whenever I stopped clattering around on the crusty snow, the silence was almost perfect, except for a brook here and there or the rare birdsong. That’s something you’re not likely to enjoy at Heather Meadows. With apologies to Robert Frost, the woods on Anderson Mountain were dark indeed, and we had miles to go. We had one of those steady drizzles all day which can be a bit annoying, but also adds a sheen and a richness to the foliage which almost makes one forget the freezing hands and the soggy socks. I was taken with the many outcrops and loose chunks of the slaty gray phyllite rock that the mountain is mostly made of. 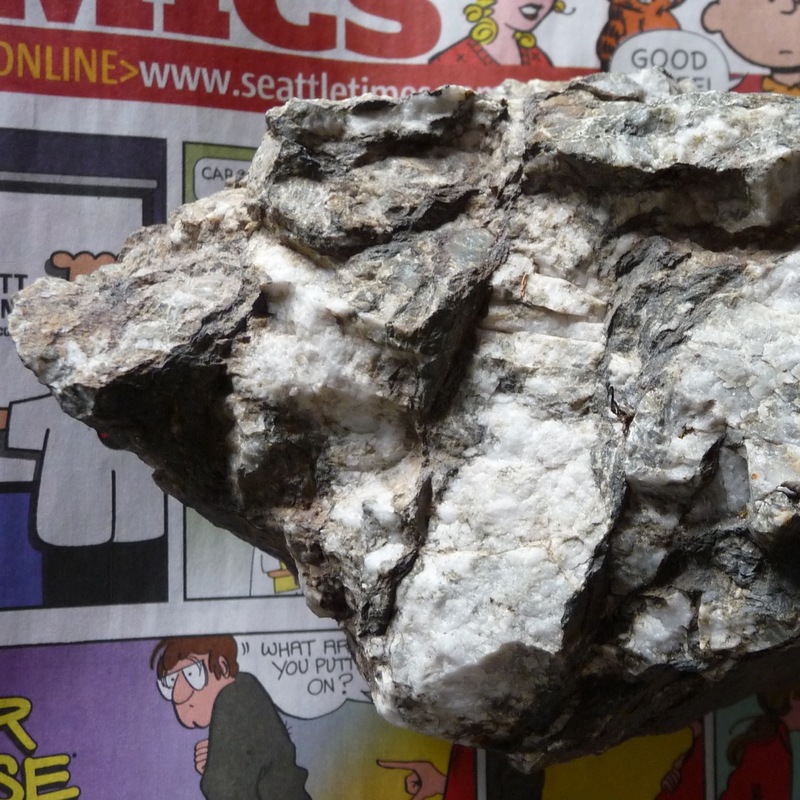 It is called the Darrington Phyllite and is widespread in our area (and apparently as far away as Darrington). 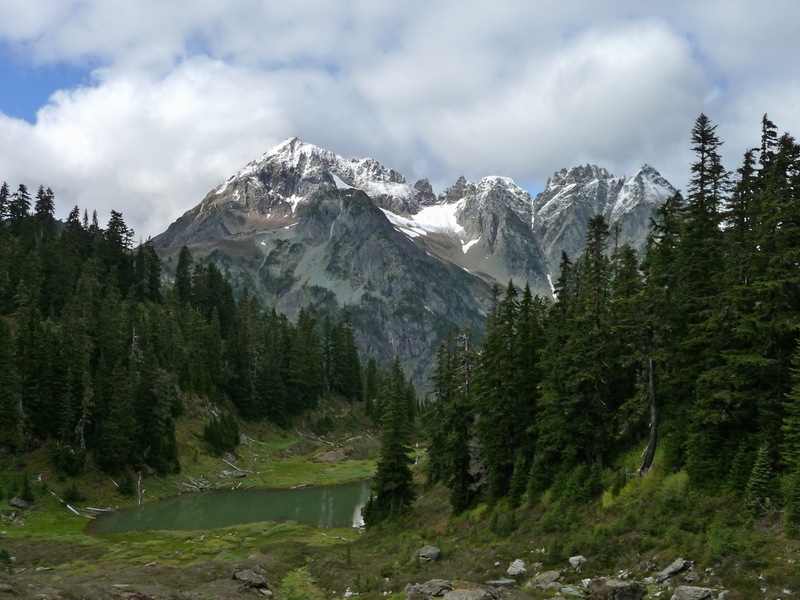 It is associated with the Shuksan Greenschist that forms Mount Shuksan, and we see it on lots of trails, including Goat Mountain (which is one big chunk of phyllite) and Lily and Lizard lakes. Phyllite – a fine-grained metamorphic rock with a well-developed laminar structure, intermediate between slate and schist in degree or metamorphism. Which is to say that it fractures along planes that are sort of slate-like, but not nearly flat enough for a blackboard or even a roofing tile. And those planes can have an almost silvery metallic shine, which is also enhanced by the rain. This particular phyllite also has many intrusions of light-colored minerals (quartz and feldspars) that were deposited in cracks from superheated solutions that seeped up from magma chambers at some point in the rocks formation. These solutions also typically carry metals in solution, including precious ones like gold and silver as well as more mundane but valuable elements like lead. 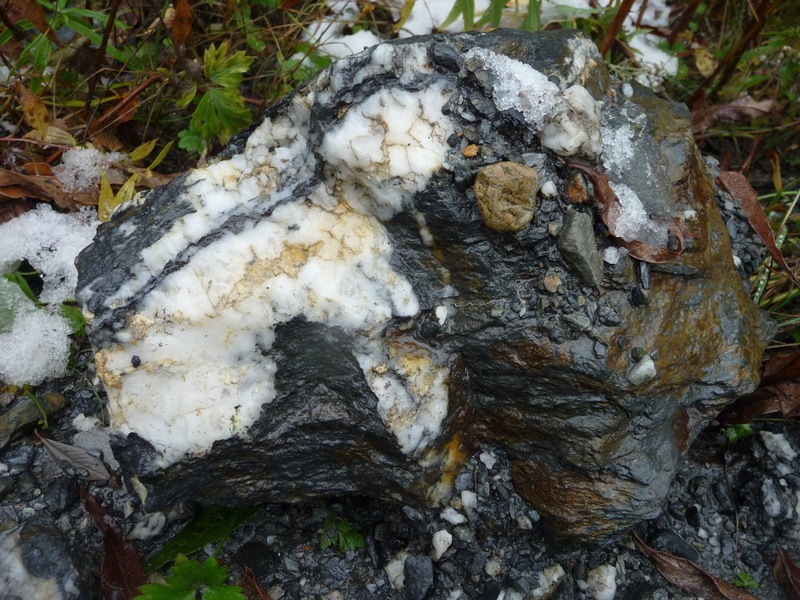 Indeed, most of the successful gold mines in the area, including the only remaining active mine, the Lone Jack near Twin Lakes, were carved into these quartz seams in the Darrington Phyllite. But back to the hike. 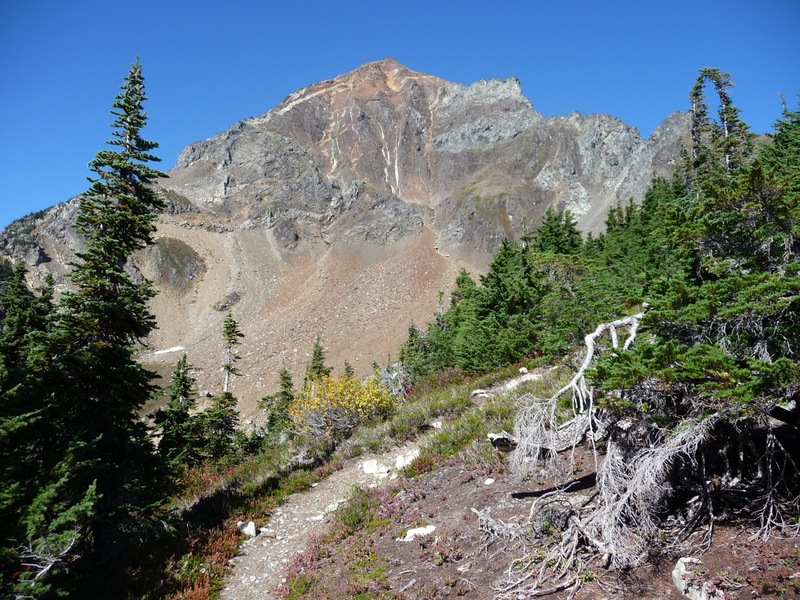 I have been on this hike several times with different groups, but always before we had started at the trailhead near Alger-Cain Lake Road, at an elevation of about 500′, and we’d never made it to the summit. 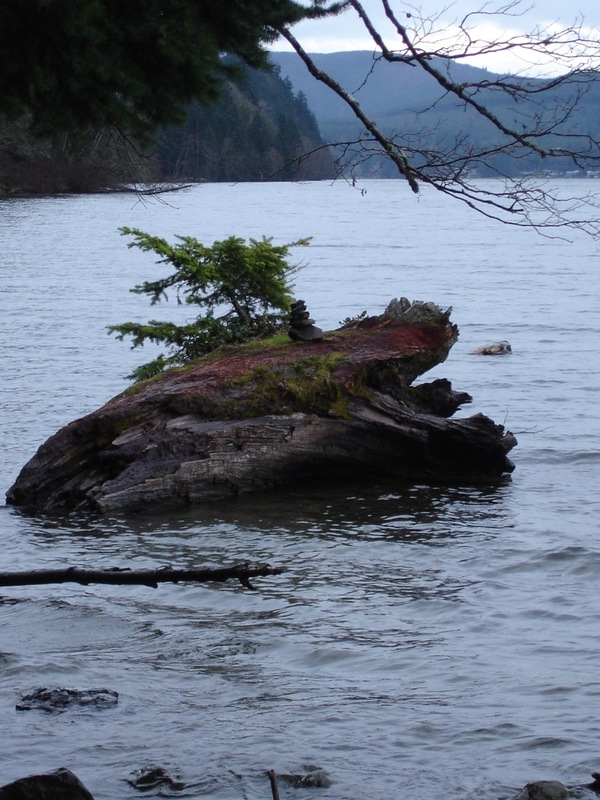 This time, Pat had checked with the DNR and knew that we could drive from south of Alger to a trailhead at Big Stump, an enormous old cedar stump next to the road. We took a few wrong turns on our way up the logging road, but we did eventually find Big Stump. This was going to cut 1100 feet of elevation gain and about 2.5 miles off the hike, greatly increasing our chances of getting to the top. On the other hand, it meant we would be going where I’d never been before, and that always makes me nervous. I don’t know how much of a leader I am, but I know that I am a really crappy follower. People still talk about the impromptu “Chuckanut Ridge Death March” where we tried to get from the top of the ridge to Lost Lake on the east side of the ridge by hiking steeply down the west side of said ridge. (Spoiler alert: It didn’t work out very well.) As it happened I had transferred onto my GPS a track from a previous hike, and had looked the map over pretty well and traced one road, the one that led to the summit, onto the GPS. 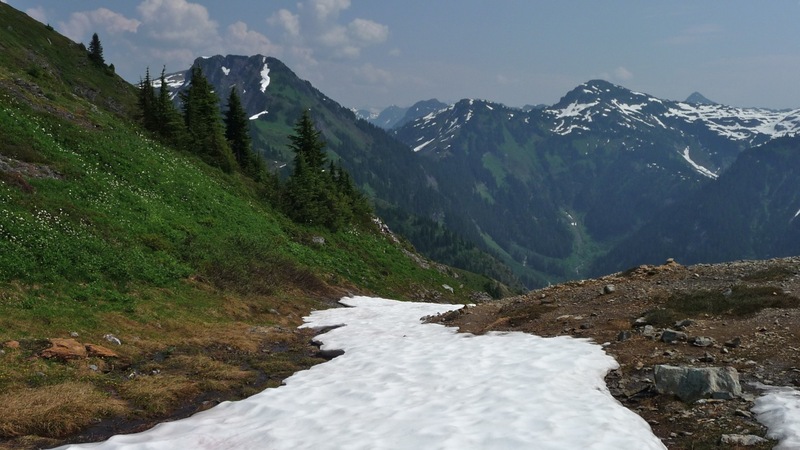 We followed the Pacific Northwest Trail (PNT) on our way up the west side of the mountain, and when we got near the summit (and near the end of my GPS route), those who had been there before agreed that we should do “The Loop”. The previous mile or so had been on a “good” logging road that bypasses the summit and continues on down the east side, ultimately emerging on Highway 9 near Wickersham. 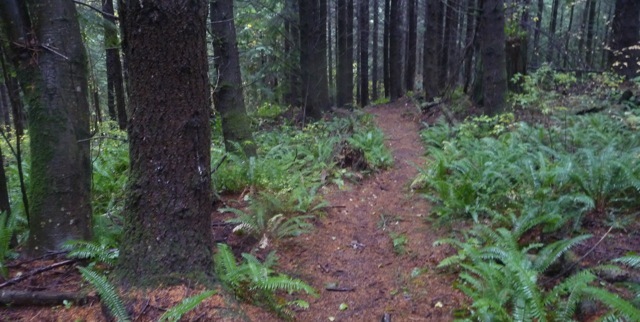 I figured that “The Loop” would mean following the PNT along an old abandoned road to the summit (which was on my GPS) and looping around and reconnecting with the “good” road (which was not) and following it back up to the start of “The Loop”. So we followed the abandoned road, which curls around the summit, to its end and then started down a trail, and steeply down at that, which would loop down to the road. We stopped for lunch in a protected spot with some convenient logs for sitting, and shortly after resuming the trail abruptly ended at a road. It was headed uphill to the south – “just the ideal thing for getting back to the start of The Loop,” thought I. But it didn’t look right to Pat and he headed on down a steep slope with no suggestion of a trail – a lot of logging debris, a real mess. But I have a lot of faith in Pat. He’s been around here all his life and he’s never led us very far astray. (He often gets blamed for the Chuckanut Ridge Death March, but that fiasco really belongs to someone else, who will remain nameless). So I went back and got the others, and made a deal with myself that I would try to keep my mouth shut for awhile. But if we got down to the 2500′ level I would raise hell. (We were already about 500′ below the summit (3300′) and had to get back to 3100′ at the start of The Loop.) We caught up to Pat at the road, which at least was aiming in the right direction but was still going down. Finally at about 2700′ the road turned up and after about a mile we found ourselves back up at the start of the Loop, with no casualties and none the worse for wear. Pat had been right all along – apparently some workers had been up there this summer with their Tonka trucks and had obliterated that one portion of the trail. Good ol’ DNR – you gotta love ’em!